The Fisherman Foundation representative from the U.S. visits Anihan. The Fisherman Foundation Director of Operations, Gabriel Nicolau, together with his wife, Lara, visited Anihan today to see the school and meet the students. Mila Araneta (FPTI Executive Director), and Pam Bermejo (Anihan Business Development Officer). 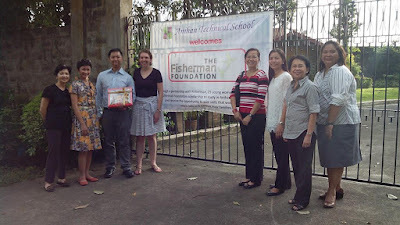 A U.S.-based NGO, The Fisherman Foundation, provides scholarship grants to 25 Anihan students. The Fisherman started collaborating with Anihan last school year and this is the second time that the foundation's representatives have visited the school. There are 25 Fisherman scholars enrolled in Anihan. They began in June 2014 and have already finished at least two National Certificate II (NC II) qualifications. They are now in their second year of schooling. By the end of October this year, they will have acquired the following three qualifications and passed its respective national assessments: Bread and Pastry Production NC II, Food and Beverage Services NC II, and Cookery NC II. In November, they will undergo on-the-job-training (OJT) in various restaurants, country clubs, pastry shops and other food establishments. Based on Anihan graduates' track record, these 25 Fisherman scholars are also expected to be immediately employed right after their graduation in May 2016. Happy with the performance of the 25 Fisherman scholars, Mr. Nicolau expressed their foundation's commitment to continue assisting Anihan. Watch the Fisherman Scholars tell their stories here. Would a photo with at least some of those 25 (were they 1st, now 2nd years or 2nd, now graduates?) "...see the school and meet the..." scholars complete the caption? Thank you!